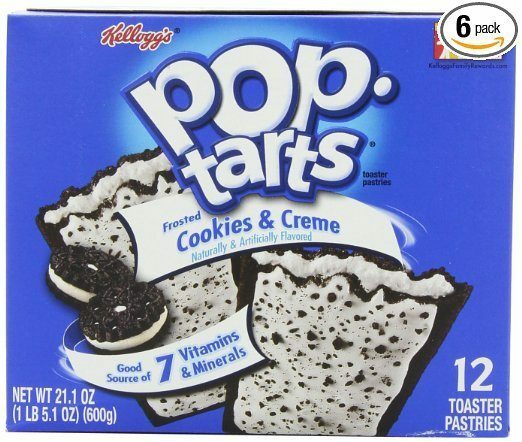 Pop-Tarts, Frosted Cookies & Cream, 12-Count Tarts (Pack of 6) Just $9.66 Shipped! You are here: Home / Great Deals / Amazon Deals / Pop-Tarts, Frosted Cookies & Cream, 12-Count Tarts (Pack of 6) Just $9.66 Shipped! Head over to Amazon and get Pop-Tarts, Frosted Cookies & Cream, 12-Count Tarts (Pack of 6) for just $11.59 when you clip the 25% off coupon and select Subscribe and Save. Or, pay just $9.66 when you Subscribe to five or more items in one month! That’s just $1.66 per 12-pack!